Organize reviewers and collate review results into categories in a snap. In seconds you can 'slice and dice' the data and correlate the response to reviewer characteristics or specific responses. 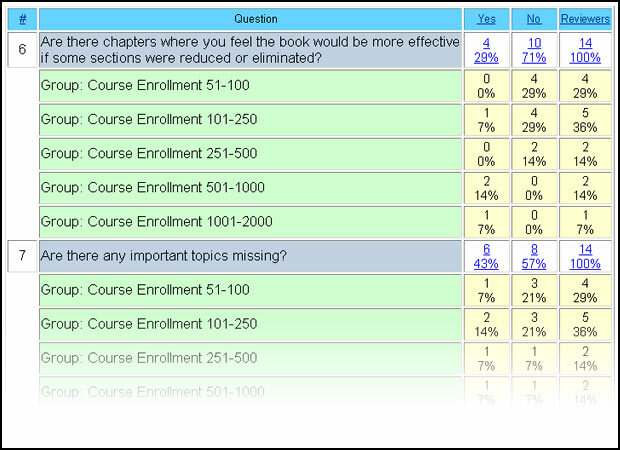 TextReviews has nine built-in demographic groupings, including enrollment, years taught and school type. If the built-in ones aren't sufficiently targeted, editors can build their own criteria right into the review or manually partition reviewers. Each reviewer response is automatically analyzed, organized and displayed using the selected subgroups, all in a matter of seconds.